James Wellbeloved Grain Free dog food - Turkey & Vegetable. Ideal for maintenance of adult dogs. Made with natural ingredients with added vitamins and minerals. Hypoallergenic - grain free recipe is ideal for dogs with skin or digestive sensitivities. Single meat protein. James Wellbeloved Turkey and Vegetable is formulated without cereals. No added artificial colours, flavours or preservatives. A blend of omega-3 and omega-6 fatty acids promotes a healthy glossy coat. Added yucca extract helps to reduce stool odour. Added prebiotic - natural chicory inulin encourages beneficial bacteria in the gut. Joint support JW+ - chondroitin, glucosamine & herbs. With lamb protein source and selected carbohydrate sources of pea and potato. James Wellbeloved Turkey and Vegetable is a dietetic food excellent for the reduction of ingredient and nutrient intolerences. 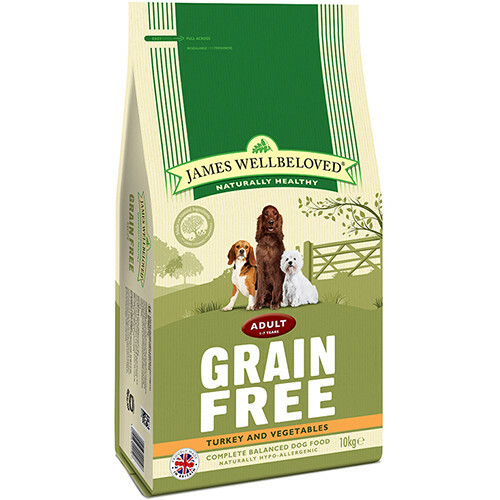 James Wellbeloved Grain Free is a complete dry food with the bonus that it is hypo-allergenic.